Useful Chemistry: Live Tweeting Haumea: the Open Science Ratchet at work? Live Tweeting Haumea: the Open Science Ratchet at work? 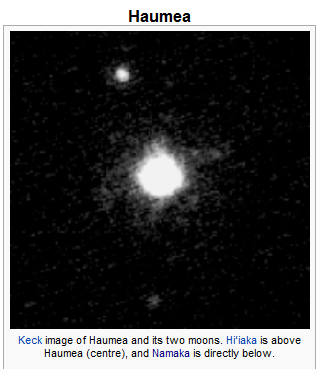 Eugenie Samuel Reich just announced on the Nature NewsBlog that astronomer Mike Brown live-tweeted his observations of a transit of dwarf planet Haumea by its moon, Namaka. About a year ago, I wrote about Mike Brown and the controversy about the discovery of Haumea stemming from a competitor's more aggressive data dissemination practice. In that post I speculated that we could expect accelerated data sharing over time due to the Open Science Ratchet, where the actions of scientists that are most open set the pace for everyone else working on that particular project, regardless of their views on how secretive science should be. I don't know if Mike Brown has changed his views on data sharing - or if he has always felt this way but thought it was too risky until now. Either way, he certainly is taking the lead at this point to demonstrate how radical openness can be done in astronomy!